17. Hunan Beef (Wholesome Yum) – Looking for cheap family dinners that are fast? Like road runner fast? Look no further! This Hunan beef recipe takes only about 15 minutes to serve up, and it’s Paleo friendly, low carb, and gluten-free! 19. One-Pot Cajun Pasta (Strength and Sunshine) – Here’s a meatless dish that is sure to save you money and dishes since it’s a one pot meal. 🙂 It’s also gluten-free and vegan friendly. 20. Apricot Pork (Frugal Minded Mom) – When you’re a busy mom desperate for cheap family meals, the crock pot is your BFF. This particular recipe can feed approximately 6 for only $6.14 total (that’s about $1 a person)! 21. 20 Minute Meatless Enchilada Skillet (Frugal Minded Mom) – This 20 minute meatless meal is not only a fantastic cheap meal for large families (thanks to the whole “no meat” thing), but it’s also perfect for busy families on the go (a.k.a. all of us)! Bonus: You can easily mix and match vegetables for this recipe to use up whatever is lurking in your fridge and about to go bad. 22. Beef Fajitas With Homemade Tortilla Chips (Frugal Minded Mom) – A crock pot may not seem like the ideal gift for a co-ed, but believe me, it’ll allow him or her to take advantage of tons of cheap healthy meals for college students. This recipe is a great example. It can feed 6 hungry college kids for just over $6 in total! Tip: Here are some more cheap and easy meals for college students. 23. Southwest Skillet Chicken and Rice (Living Sweet Moments) – Spice up your week with this southwestern themed cheap recipe for families. 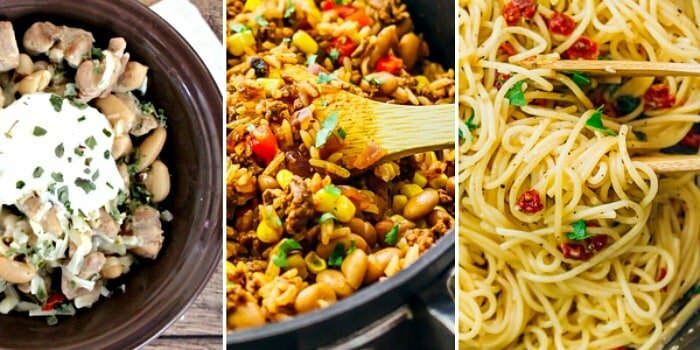 I love the mix of flavors, how fast it is (just 30 minutes), and the fact that it’s a one pot meal. 24. Ranch Potatoes and Chicken Sheet Pan Dinner (Living Sweet Moments) – Unfortunately, many inexpensive meals for large groups require you to dirty just about every dish in your kitchen, but not this one! This sheet pan recipe is light on the dishes since you cook the chicken and potatoes together on one sheet so you can spend less time standing over the kitchen sink and more time with your friends and family. 25. Majaddara (Living Sweet Moments) – Take your tastebuds on a journey they won’t soon forget with this cheap family meal. It combines rice, lentils, and rich spices for a Middle Eastern dish that is sure to have the whole family asking for seconds. 26. White Chicken Chili Recipe With Sour Cream (Confessions of An Over-worked Mom) – Whether you like it or not, colder temperatures aren’t that far off. It’ll be fall (and then winter) before you know it. When it gets chilly out, I love to make hearty soups and stews including chili. 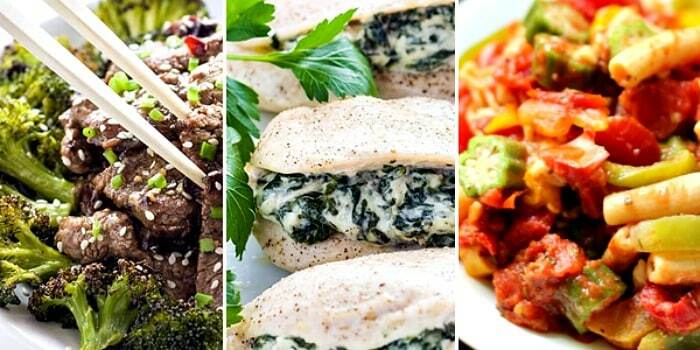 Luckily, many of these recipes make great cheap meals for large groups. If you’re looking for a fun twist on chili try this white chicken chili recipe. 27. Southwest Beef and Rice Skillet (Savory Tooth) – Here’s a cheap family dinner option that’s also a one pot (er, skillet) recipe. The bold flavors are sure to make even a weeknight a little more exciting. Bonus: It requires just 15 minutes of prep time! 28. One Pot Spaghetti Aglio E Olio (Savory Tooth) – Sometimes the simple things in life are the best, right? Well, cheap meals for family dinners don’t get much simpler than this! Spaghetti noodles, sun dried tomatoes, parmesan cheese, and fresh parsley come together to form a mouth-watering meal. Option: Substitute the parsley for fresh basil for a slightly different flavor. 30. Easy Low Carb Pizza Chicken Skillet (Low Carb Yum) – Do you have a love-hate relationship with pizza? I mean, sure, it’s delicious but it’s also loaded with carbs and takeout options that can be pricey. (Don’t worry, you don’t have to give up pizza as part of your quest for cheap family meals.) Here’s an affordable and healthy option that is sure to please. 31. Easy Beef Enchilada Pie (Mashup Mom) – This recipe had me at the word “pie.” 🙂 Okay, so this cheap meal for large families isn’t that kind of pie, but it’s still a tasty recipe that’s sure to have you scraping your plate to get every crumb. 32. Hoisin Pork Stir-Fry (One Clever Chef) – If you’re lucky enough to live off campus (or in a dorm suite that has a kitchen), this 8 ingredient recipe makes an awesome cheap healthy meal for college students. Bonus: This recipe is extremely flexible, so you can use just about anything you have on hand. For instance, no pork? Substitute chicken or beef. 33. Sheet Pan Chicken Drumsticks With Broccoli & Potatoes (Mashup Mom) – Can you feed a family of 4 for $5 or less? With this cheap recipe for families you can! This one sheet pan is healthy, delicious, frugal and super easy to clean up. Yep, it’s a win all the way around. 34. Chicken Burrito Bowls (Mashup Mom) – Whether you need an inexpensive meal for large groups or a family dinner, this recipe is for you. It’ll feed a family of four for less than $5, and you can easily double (or even triple) the ingredients to feed more people.